Art Therapy is the use of art materials and the creative process within a therapeutic relationship to improve cognitive, emotional, physical, and spiritual wellbeing through a deepening of personal awareness and development. Moving towards the depths of the self can be a scary place to enter alone. A trained art therapist can create the container to hold deep emotions and provide the vehicle for insight to emerge. Sometimes words cannot articulate the complexity of difficult experience. ​Touching warm clay, spreading vibrant color on a canvas, or arranging objects in sand can express meaningful emotion and elicit clarity. Art Therapy facilitates an engagement with deep personal imagery and narratives to support healing and transformation. At Open Mind Holistics our trained Art Therapist, Sarah Klein, works with you wherever you are at to support life transitions, relationship challenges, grief and loss, trauma, anxiety, depression, creative blocks, and self-esteem. Sarah combines Art Therapy with Transpersonal Counseling strategies to best suit the clients' needs. WHO CAN ART THERAPY HELP TREAT? ​Art Therapy helps individuals and couples of all ages to address social, emotional, physical, and spiritual challenges, such as: depression, anxiety, trauma, grief, creative blocks, spiritual emergency, interpersonal and relationship issues, and major life transitions. WILL MY ART BE EVALUATED? Art therapy sessions focus on your own personal meaning found through creating artwork, rather than on interpretations imposed by a therapist. The role of the art therapist is not to interpret or pathologize artwork, but instead to help guide you toward insight and clarity within your own creative expressions. WHY USE ART MATERIALS IN THERAPY? Art is a vehicle to tap into realms where words cannot reach. These materials allow individuals to engage in sensory and tactile experiences that can result in personal symbols and meaning-making. Art materials have unique qualities that elicit emotional content in a different way than "talk therapy." ﻿DO I HAVE TO BE A SKILLED ARTIST? No. Art experience is not necessary to engage in art therapy. An art therapist is trained in a variety of materials and media and can help to guide you in the art-making process. 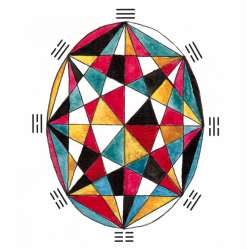 Sometimes a simple shape or color can hold significant meaning and can help facilitate healing. For more information on Art Therapy, check out the American Art Therapy Association Blog. Transpersonal Counseling is a holistic form of therapy that includes the spiritual domain of experience as valid and part of the "whole" experience of being human. You do not need to identify as religious or even spiritual to engage with Transpersonal Counseling. Rather, it is a therapeutic framework that helps individuals make meaning in their lives. Transpersonal literally means "beyond" or "through" the personal. Transpersonal Counseling addresses the complexity of an individual, moving into and through the depths of personal experience, and sometimes moving beyond the personal to spiritual, unconscious, or archetypal arenas. ​Transpersonal counseling is useful for addressing issues of life transitions, grief and loss, anxiety, self-compassion, trauma recovery, and finding purpose. Click the button below to schedule a complimentary 30-minute consultation.